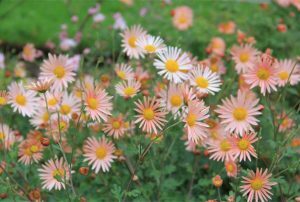 Two perennial late-blooming favorites, Chrysanthemum ‘Hillside Sheffield Pink’ and Aster ageratoides ‘Ezo Murasaki’, are taking the cool weather in stride. Their flowers stand out in the sparse gardens and glow in the autumn light, adding to the seasonal fall scene. This is one of the best times to take a walk outside and enjoy the autumn transformation. When walking through Blithewold, notice how the gardens have transformed from lush flowers to their winter look. Some perennials are left untouched for wildlife, and other areas where annuals have been taken out are already planted with tulip bulbs. 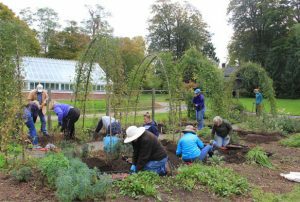 Garden staff and volunteers work to ensure the gardens have proper care for winter and for next year’s spring blooms. 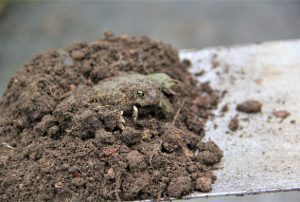 Our soft soil must be ideal for American toads to hibernate in, as we unearthed many of them while planting tulips. Thankfully, there were no casualties, just our surprised gasps when they were uncovered. We did relocate the poor sleepy toads back under the soil. They will spend their winters under the frost line in a transformative torpid state, and they’ll emerge when the tulips bloom in spring. As I work in the Cutting Garden I see four red-tailed hawks circling together high in the sky. They give their distinctive calls, sounding to me like the prehistoric winged dinosaurs, Pterodactyls. It’s a déjà vu moment for me ̶ I always see and hear multiple hawks circling at this time of year. I marvel also at the call of a Carolina wren that I’ve been hearing, just once, every day. I’ve only seen the little bird a few times; its call is as loud and clear as the hawks’ but so much sweeter. 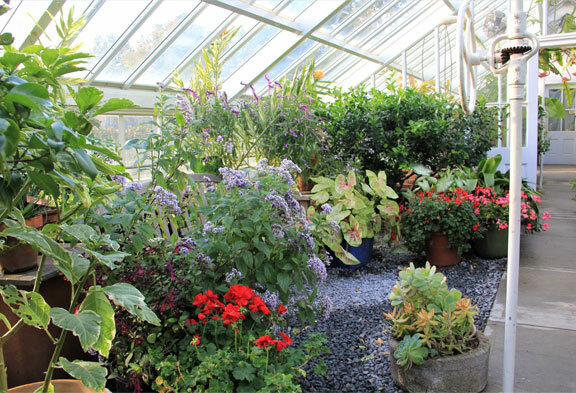 The greenhouses are a treat to enter in after a cool stroll through the gardens ̶ another transformation from a fall garden walk to an indoor garden delight and a treat for the senses. Click here to watch Gail’s video of a toad in the garden.